This entry was posted on July 3, 2014 at 7:20 am	and is filed under Other Dogs, Phillip, Sherman & Stanley. You can follow any responses to this entry through the RSS 2.0 feed. You can leave a response, or trackback from your own site. Great picture! I hope none of them are afraid of loud noises with thunder storms due and fireworks tomorrow. You both will have your hands full. Have fun with them. East Millstone has gone to the dogs! And that’s a good thing. Wow, you have your hands full this weekend! Looks like fun. Have a safe weekend. Me too. I couldn’t help but think – what a nice thing to come home to! I am also envious of all the fun you’re going to have with five (count ’em, FIVE) beagles around! Now all you need is to put the beagles and the poodles together and the fireworks will REALLY start! Everyone have a safe Fourth of July weekend, people and pets alike. You’ll need a kennel license soon! Everyone on two legs and four have a safe and happy 4th! Now we’ll need to invent all the rules for Beagle Poker … first definition is “Full House” = 3 tricolors, 1 freckled/ticked, and 1 lemon beagle. Happy Independence Day Weekend! You always crack me up!!!! Be safe and happy all !!! 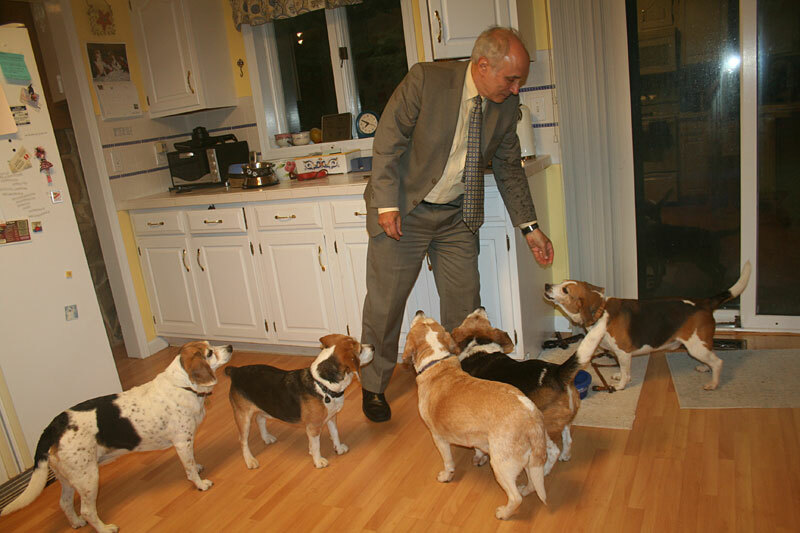 Wow – five beagles! That’s a whole lotta hungry right there! I went out a few minutes ago to move my car out of the way of the painters working on the house next door, and when I came back around the corner I saw three little beagle faces peering out the front window at me, wagging and smiling and smearing snooter juice on the window. So that would be two tri-colors and 1 freckled/ticked – a winning hand for me! Not sure… Whisky beagle had snooter juice, but Bartles Basset is SO MUCH WORSE!!!! Imagine…. A shine of drool unlike any other And sticky as glue!!!!! LOVE this picture! Five beags – good luck!! Looks like fun! I’ve always wondered how a pack of beagles get along when it’s feeding time. Keep me posted! My dream, a pack of Beagles! I am jealous too Jenny. Went out and got a Thunder Shirt for Huggy last night, hope it works. Be safe everyone, keep your babies safe too. Two! When the late great Rosco passed away I said never again. Two weeks later I was looking. And six months later I had wonderful Oscar. Spencer was pushed on me. I really really resisted. But now I am very very happy. Except, you know what they say about babies. If the first one is perfect. STOP! The second one will be a brat. True with my two, but a wonderful brat! The right one or two or three will find you, Scott! where I live you can legally have 10 dogs per household. Imagine 10 beagles. Oh My! Ten beagles in one house. Sounds like a great TV Reality Show.